Bob Fenner Tableau de Condy! Condylactis gigantea, the Giant Anemone. Largest species in the range (6-12 inches in diameter when extended). White body and tentacles. The latter bear enlarged tips typically of a contrasting color, though they may be white. Right: In an aquarium Below: Bahamas pix including one of this species handful of symbionts (a Diamond Blenny, Malacoctenus bohlkei bottom right), others include Pederson's, the Squat Anemone Shrimp (below middle) and the Spotted Cleaner Shrimp, and Banded Clinging Crab. 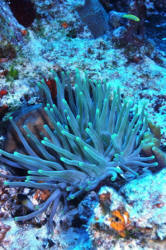 Captive specimens tend to lose the "bulbiness" of their tentacles ends. 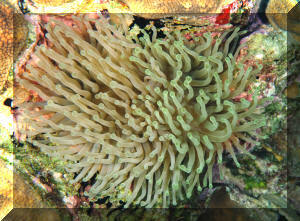 At right and below Condylactis gigantea in an aquarium and in Cozumel... Wish we were drifting northward on Santa Rosa Reef right now! And here's a C. gigantea with its commensal crab, the Banded Clinging Crab, Mitharaculus (nee Mithrax) cinctimanus in residence. Cozumel pix. The Spotted Cleaner Shrimp, Periclimenes yucantanicus in its host anemone, Condylactis gigantea off of Cozumel. 3/4-1 in. overall. 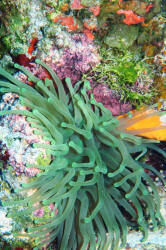 Also found in association with other tropical West Atlantic anemones. Condylactis gigantea (nee passiflora), the (Florida) Pink-Tipped Anemone. 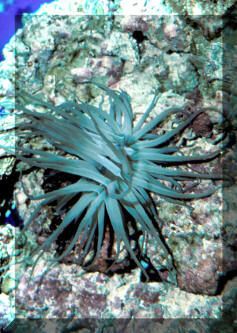 The most commonly (and inexpensively) offered anemone species in the trade by far (in the West). For good reasons... many colors, hardy. Captive and Belize photos. Indo-Pacific Condylactis species; poss. C. elatensis. 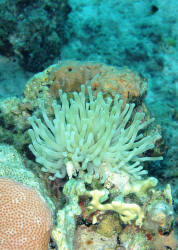 Though most of these come to use from the tropical West Atlantic as inexpensive "Condys", there are Indo-Pacific species. This one in Fiji.